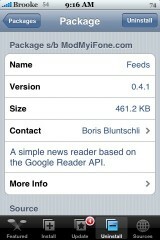 Feeds is a native iPhone RSS reader application. 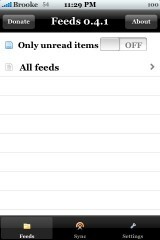 This application works with your Google Reader RSS account, pulling in the Feeds you are subscribed to through Google Reader. When you open the application, you will see a lower menu bar. You will want to go into the Settings option first. Here you will add your Username and Password that you use to sign into Google (like gmail, Google Reader, Google Docs…). 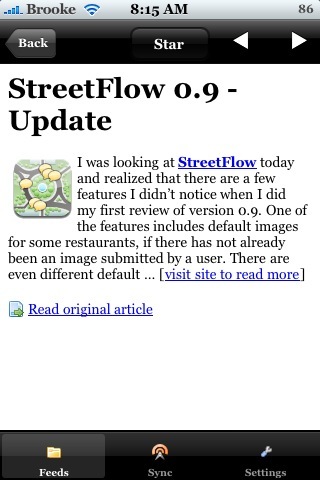 You can also choose the font size and cell padding amount. The Cell padding is the amount of space between each article. However, I found that if you move it off of 10 (the stock setting) it starts to affect the number tag making it unreadable. Once you have everything entered into the Settings, select Apply changes. This will bring you back to the main page. 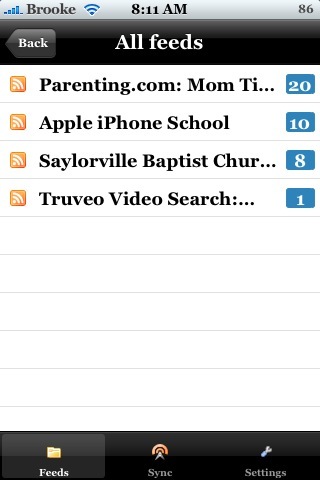 You will now want to select the Sync option in the lower menu bar. It will take a little longer than normal to sync the first time. 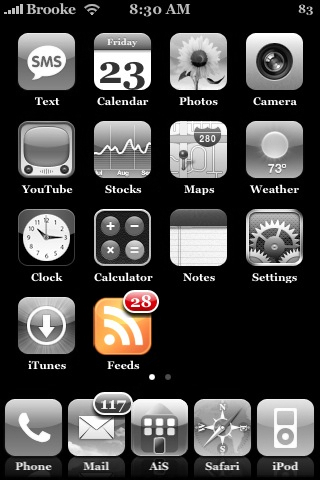 I actually had an issue with Feeds not finding my feeds the first three or four times I sync. I gave it some time and tried again and it worked. 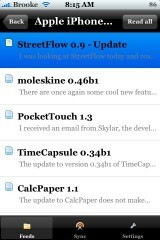 So, if your feeds don’t show up when you sync the first time, you might try giving it some time and then trying again. On the main screen, there is also an Only Unread Items options. 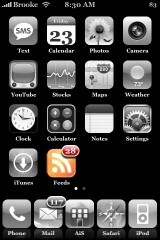 If turned on, it will only display new articles your feeds list. 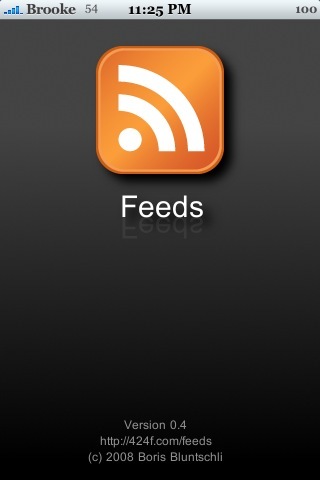 Ok, once your feeds have finished syncing, you can select All feeds. 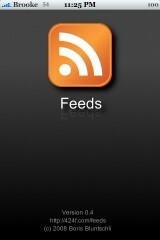 This will bring you to a list of all your RSS feeds. 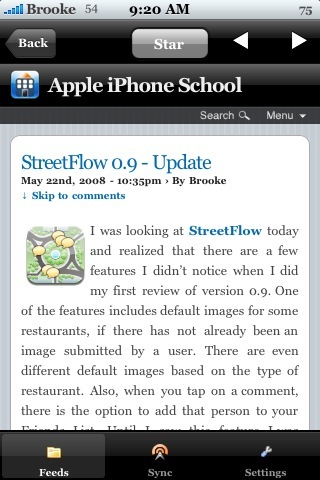 It will display a number to the right of the feed title indicating how many unread articles there are in the feed. 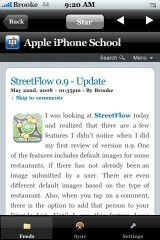 You can then tap on a feed title to get a list of the articles in that feed. The unread articles will have a blue paper icon next to them and the read articles will have a white page icon next to them. There is also a Read All option at the top of the screen which allows you to mark all the article as read. To read an individual article, just tap on the article’s title. When you select an article you will get a snippet of the article, you can then select Read original Article which will open the entire article in Feeds or you can select visit site to read more which will open the full article in Safari. You can also Star the article. If you star an article, it will keep it marked as unread (however, you have to sync again for it to show up as unread) and it will add a star to the article in your actual Google Reader as well. I would love to see it add an actual star to the article in Feeds like it does in Google Reader, maybe with the next update. 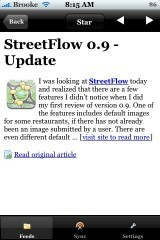 You can also navigate through the rest of the articles by using the arrows at the top of the screen. To get back to the main feeds list, tap back. If you close the application, it will add a badge to the Feeds icon indicating the number of unread article you have. The only issue I have with this application is that it is a little slow when it syncs and when it pulls in the entire article however, it is not completely unbearable! 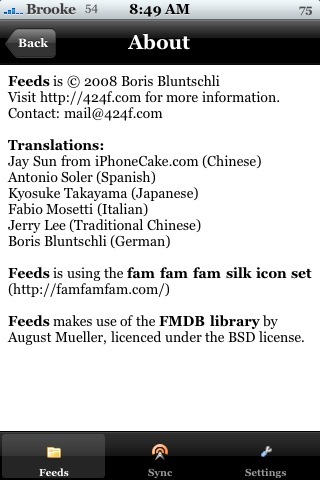 Feeds is available through the ModMyiFone.com source. I had tried this once. 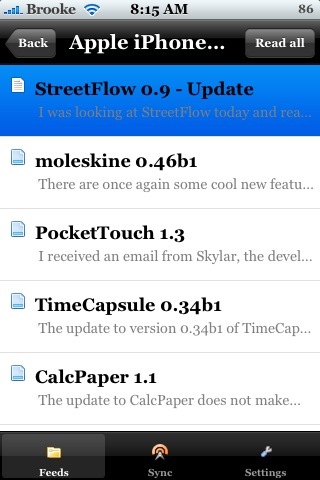 It seemed to bomb because I had too many feeds or unread items. 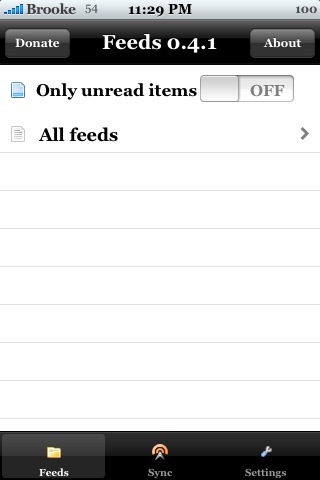 I had it sync with my account and it said I had something like 378 unread items (i had more). Every time I tried to start the application, the spash screen would appear for about 10 seconds and then it would just drop me back out to the home screen. I could never get back into the application after syncing. I tried re-installing. But, I didn’t clear out the data files so it just did the same thing. D you guys know how can i download the english version?! I wonder why don’t you have a review of this app sooner ? I have used this app since the very first version … and this is a very good app to use rss (i don’t know why smartRss give my touch crash). Hey Brooke. i don’t know is this app can show image ?? you probably all know this, but I just found it for my touch here in the uk and it’s perfect. 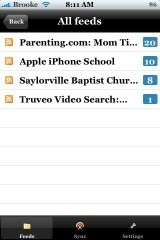 Can’t seem to get it to sync, just list no feeds. 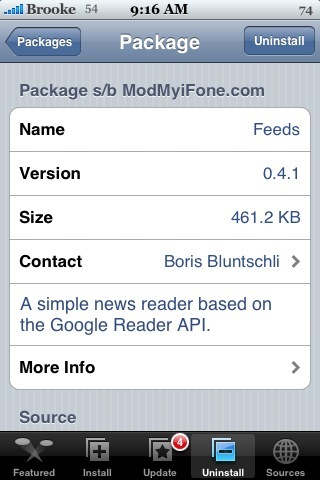 I will just use google reader. Much better than smartRSS and MobileRSS.